"When use Micro SD card playback, select the SD card mode Check whether the Bluetooth connection is successful It's been 6 months, our engineers redesign the Turbine idea, trying to make it better and better for you. 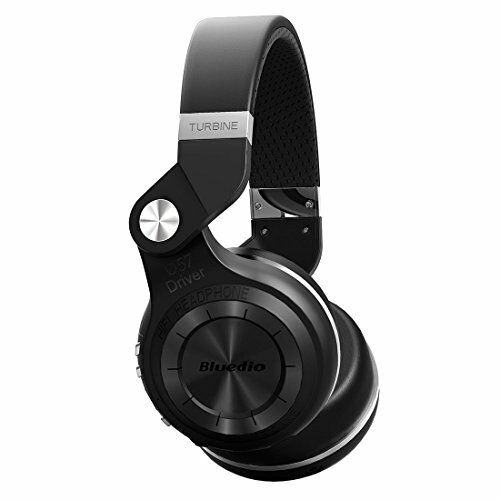 And Bluedio T2 Plus comes along, a upgrade for H Plus. Besides keeping all the pros of the previous version, T2 Plus can fold up for easy carrying, and strengthened in headband. Pairing Tip When pairing, you need to make sure the headphones have entered pairing mode, here is how to enter pairing mode: When the headphones are off (If not, turn off the headphones first), press and hold the Power Button until you see the blue light stays on (instead of blinking). About Bluedio Bluedio is a pioneer in portable audio device, providing solutions to professional audio and wireless communication. Bluedio always strives for perfection, fashion and simplicity, focusing on revolutionary innovations. So far, Bluedio has owned over 30 patents, highly praised by consumers over 34 countries. Warranty and Customer Service information 1 year warranty from the date of purchase Email Bluedio Customer Service, get answered under 24 hours: you can click ""Your Account"" on Amazon, click""Your Orders"", find the Bluedio order, click ""Contact Seller"". Specifications Bluetooth version:V4.1 Supported Profiles: A2DP, AVRCP, HSP, HFP Drivers: Φ57mm Impedance: 16Ω Frequency response: 20Hz -20KHz SPL: 110dB Operating distance: up to 32 ft (free space) Bluetooth music time: about 40 hours Bluetooth talk time: about 45 hours Standby time: about 1625 hours Fully charged time: about 2 hours In the box: Bluedio T2 Plus wireless headphones Micro USB charging cable 3.5mm Audio cable User manual "
【Foldable & Portable】195°rotary design, to save more space and easy to carry& Support Micro SD card(up to 32G) and FM radio. 【Φ57mm Ultra-Big Speaker】brings amazing bass for you. But its impedance is only 16Ω, easy to drive by smart phones, tablets and PCs. 【Bluetooth 4.1】the latest Bluetooth version, brings top speed & power saving & enhanced transmission, superbly compatible with iOS, Android and Microsoft, a perfect match for 4G, standby time up to 1625hrs. 【Line-in Audio】to enjoy music without interruption. Line-out audio, to share music with your friends anytime. If you have any questions about this product by Bluedio, contact us by completing and submitting the form below. If you are looking for a specif part number, please include it with your message.